Playing Hot will perform April 18 through May 12 at Theater 511. In advance of the start of performances, we’re introducing you to all the remarkable artists involved. Today, we’re pleased to feature cast member Danté Jeanfelix, who has been with the project since we first started developing it in 2015. Hear from Danté below and grab your tickets today! Danté Jeanfelix: From the first time I read this script, I knew there was something magical and truly special about this show, that I just had to be a part of. It tells an important story about one of the most important contributions to American culture and examines how time has treated it. I am honored to be helping to tell this story. What I am most excited about, in doing this show, is the way in which we are telling this story. This play works like a great piece of jazz, it will excite you every moment with its twists and turns, but it will also hit you in ways you may not expect. DJ: Playing Hot has meant so much to me over the years. I have been working on this play, since the beginning, so over three years. I am thrilled to finally bring this show to a whole new level. It is the most fun I’ve ever had doing a show and this team has truly been like a family to me, so to do this show is a dream! PTC: Tell us about you characters in Playing Hot and where/if you see yourself in them. DJ: I play multiple characters in the show, which has been an absolute blast. There is nothing like playing a full scene as one character and then completely transforming, two minutes later, into a totally different character. It may sound crazy, but it actually gives you so much freedom as an actor, because you can’t think about your character, you just have to dive head-first into every character you portray. One of my favorite characters, would have to be Manuel Hall, the man who introduced Buddy to the cornet. Manuel is a neighbor of Buddy’s and a cook, who has such passion for what he does. He is someone that could have only come out of New Orleans, in his manner and approach to life. It is that enjoyment of life, as well as passion for what you do, that I aspire to achieve. PTC: What do you want folks reading this to know about Playing Hot? What’s the most important element of this project to you? DJ: This is not going to be your typical night of theatre. We are bringing all of your favorite things about live performance and putting them into a single night. You are never going to know where the story is going to go or how we are going to tell it, so prepare for everything and anything. The most important element of this whole experience is that we are bringing you, the audience, along for the ride. We are inviting you to join us for a night in our little slice of the Big Easy, so be ready to party! PTC: If you were to write a tagline for Playing Hot, what would it be? DJ: In our little slice of New Orleans, we play it fast, we play it loose and we play it HOT! 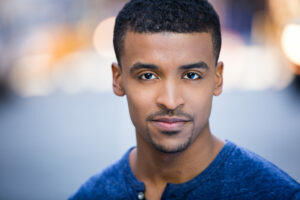 In addition to Playing Hot, Danté is currently writing and developing a new play based on the early life of Sammy Davis Jr. You can follow him on instagram at @dantejeanfelix. And don’t forget to catch him in Playing Hot, April 18 – May 12. Grab your tickets here!